On Monday of this week I travelled from Berkeley across the Bay Bridge into San Francisco to have dinner with a friend who was staying at a hotel next to the Museum of Modern Art, so I decided to go a little early and enjoy the current exhibits. 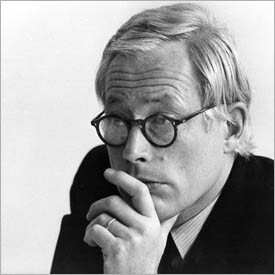 I’m glad I did, because the work of industrial designer Dieter Rams is currently on exhibit, along with his extraordinary principles for good design. Good design is thorough, down to the last detail. I hope you find these principles as sensible, insightful, and inspiring as I do. I am troubled by the devaluing of the word “design”. I find myself now being somewhat embarrassed to be called a designer. In fact I prefer the German term, Gestalt-Ingenieur. Apple and Vitsoe are relatively lone voices treating the discipline of design seriously in all corners of their businesses. They understand that design is not simply an adjective to place in front of a product’s name to somehow artificially enhance its value. Ever fewer people appear to understand that design is a serious profession; and for our future welfare we need more companies to take that profession seriously. What concerns Rams about the design of physical products today is perhaps even more evident in the design of software. Most software vendors bother little with design and fill their products with the kinds of contrivances that Rams has fought for years to discourage. “My goal is to omit everything superfluous so that the essential is shown to best possible advantage” (Rams, 1980). Business intelligence and so-called analytics vendors are notorious for their insatiable appetites for wasteful, ill conceived, and dysfunctionally designed features. With few exceptions, what they call innovation is anything but. “Things which are different in order simply to be different are seldom better, but that which is made to be better is almost always different” (Rams, 1993). The best designers, whether of the industrial variety, such as Rams, or any other type, including those who apply their skills to data visualization, strive for a marriage of form and function, beauty and usability, which refuses to see these forces in necessary conflict. Thanks to designers like Rams who care, we might someday live in a world where bad design is the exception rather than the norm. Steve — good post. I’ve read about Dieter and his ideas and learned quite a lot in the process. I’m not sure I understand his “…devaluing of the word ‘design'” comment. I suspect he’s reacting to the fact that so many seem to be jumping on the bandwagon of design too often with little idea of what that means. I can understand that, but on the other hand, anything that spreads the awareness of design concepts doesn’t seem, to me, to be all bad. I can’t say I’m anything but an interested, amateur student, but without the popular ‘noise’ on the topic, I doubt I’d have even gotten that far or appreciated how it could apply to one of my interests–presentations. In any case, keep up the great work. Unfortunately, Apple’s products are not always honest or long lasting, as was demonstrated by the battery issue of the first iPads (made on purpose not to last). There is a very interesting report in Youtube about how current designs conceive products to last for an increasingly shorter lifetime to promote consumption. Look for “Planned obsolescence” in Youtube! The rest of the note is pure gold. Love it! Awesome! I found those words inspiring. Enjoyed this post, and how you tied it to the excesses of many BI products, where even the simplest charts are of notoriously poor design. I do recall admiring Braun products for many years, without knowing who was behind them – nice to make the connection. As a designer myself for many years, I often thought of Dieter’s guiding principles, but reflected more so on those of the Shakers – whom I suspect may have influenced many designers. The highest beauty lies in harmony. Order is the origin of beauty. That which is most practical is also most beautiful.